I thought I loved Pope Francis. Like many people I admired him for the way he shunned limousines, skipped out on a power lunch to eat with the homeless and insisted his accommodations always be humble. And while as the head of the Catholic Church he won’t endorse gay marriage, surely there were better people for him to meet on his first trip to the United States than Kim Davis. Until that rendezvous with Davis, my affection for the Pope also stemmed from the fact that I am a Jew who graduated from an all-girls Catholic high school—the lone Jew in my class. Since then all things Catholic have fascinated me including the vestiges of the mid-50s Catholicism that were still omnipresent in my 1970s high school. While it’s not typical for most American Jews to attend parochial school, it was a tradition in my family that spoke to our foreignness. My grandmother learned to crochet and speak French in a convent school in Greece. Nuns tutored my mother in literature when she was in high school in Cuba. When it was my turn, I was sent to the Sisters of Mercy at Mount Saint Joseph Academy, a seemingly odd choice for a girl from West Hartford, Connecticut. It quickly became apparent that I had stumbled into an ecumenical experiment—not only for me, but also for the other girls in my class. I was notably exempt from wearing the school emblem on my blazer, a thick ornate patch of cloth that displayed a cross inside of a crown. I was allowed to sit out chapel services along with the handful of Protestants in my class. The Mount had once been glorious, palatial. By the time I arrived, it was dull gray wood and fraying maroon velvet. A large crucifix with a half-naked Jesus nailed to it floated above the chalkboards of each of the rundown classrooms. Only a couple of hundred girls, down from an enrollment of a thousand in the Mount’s prime, rattled around the place. Despite the Mount’s decrepitude there was one room that seemed suspended in amber. 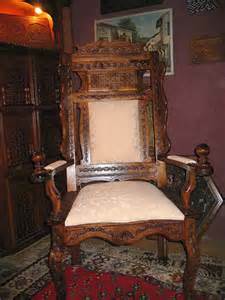 In a first-floor parlor, a room whose graciousness lingered along with the cobwebs, there was a chair with an austere mahogany wood back and plush dark red seat, cordoned off with fancy braided ropes. It bore a plaque proclaiming that Pope Pius XII had once sat there during a visit to the school. Someone had obviously still taken great pains to polish the chair’s intricate arms and dust the seat. By my senior year I had settled into the Mount. My classmates no longer expressed overt sympathy that I didn’t celebrate Christmas. Some had even happily tasted the matzah I brought for lunch on Passover. I was still different, but no longer an outsider. The Mount was my school too. And yet there was the very curious Pope’s chair, an abandoned piece of furniture that was worshipped. And so on a bone-cold winter day—uniformed and knee-socked according to the school’s dress code—I did the most defiant thing a Jewish girl at Mount Saint Joseph Academy could do: I snuck into that parlor and sat in the Pope’s chair. I’d like to say that at the time I was striking a blow against Pius’ immoral silence during the Holocaust, but I did not know that bit of history until years later. I only knew that what I was doing was provocative, even blasphemous and it felt good. The longer I sat in the chair, the more my palms perspired and my knees shook, until my lookout, Pauline, reported that the principal was marching down the hall towards us. I bolted out of the chair and hid behind the heavy curtain until it was safe. My class, the class of 1978, was the last to graduate from the Mount, but the building is a historical landmark—its exterior has to be preserved in perpetuity. For the past decade it has been an assisted living facility with the elegant name of Hamilton Heights. It offers impromptu tours for Mount alumnae, and so on one of my trips back to West Hartford I decided to visit my old high school. I used the front entrance, which was disorienting. Entering that way was strictly prohibited when I was a student. Tracy, the head of admissions for Hamilton Heights, greeted me in the foyer with a story about an older Mount graduate who came to see the place as a potential resident. She was so overcome with memories of the nuns rapping her knuckles with their rulers that she refused to get out of the car. The school that had been in such a state of deterioration was now decorated in the false, institutional cheer of silk flowers and bright, cheap art. Tracy and I worked our way from the top of the building where the nuns once lived down to the basement cafeteria. The nuns’ quarters and classrooms had been converted into small apartments. The model apartment I saw encompassed the rooms where I had taken English and history. The gym was now the Alzheimer’s unit. The chapel was a meeting room; the stained glass windows representing the Twelve Stations of the Cross were intact. On the first floor Tracy stopped at the doorway to a waiting room that I immediately recognized when she asked me if knew why it was called the Pope’s Room. I told her that Pope Pius XII had visited the Mount in the school’s glory years. “I once sat in his chair,” I admitted sheepishly. Now when I see Pope Francis or pictures of his immediate predecessors sitting in various chairs, I think of that iconic Pope’s chair at the Mount. And while I thought this Pontiff had an abundance of loving kindness, (I’m certain he’d forgive me for being a teen-age outlaw), why doesn’t his love extend to our gay sons and daughters as the children of God that they are?